Our e-bikes are Pedego City Commuters and Specialized Comos – easy to ride and plenty of battery power. 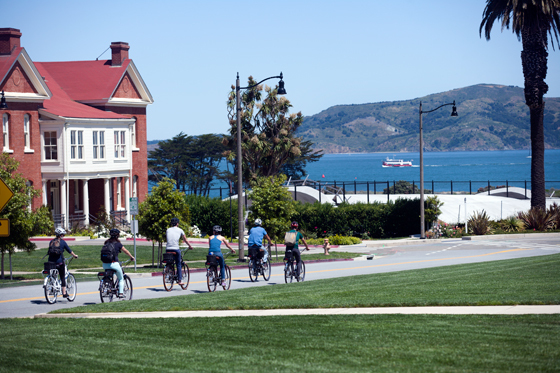 Cruise through the Presidio past the old military buildings with views of the bay. An e-bike patiently awaits the views to soak in. Small group size makes the tour .. your tour. Check our tour calendar here. If you don’t see the Majestic running on your preferred date, please contact us. 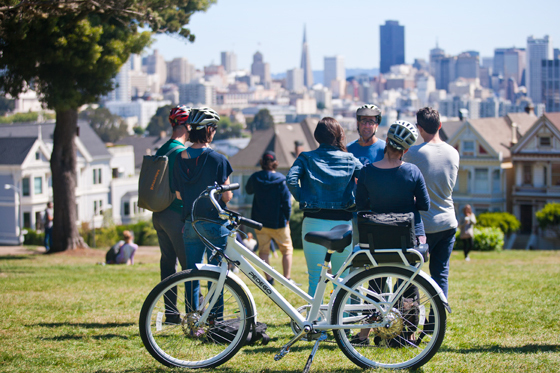 San Francisco is View City, and with our ebikes, we can take full advantage. Our Majestic ebike tour visits the neighborhoods and parks we love but aren’t easily accessible on ordinary bikes. 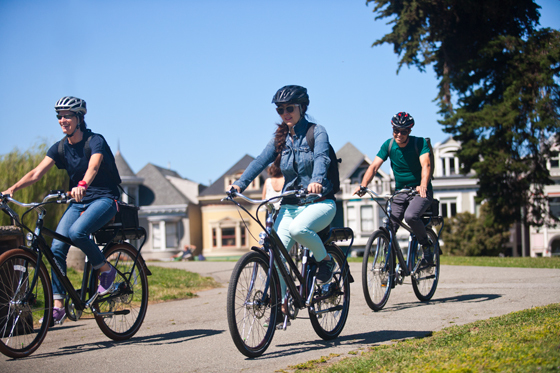 Our ebikes have plenty of power and battery capacity to propel us through the city and over the hills, and on this big 20-mile loop, we visit quintessential SF neighborhoods, the city’s most beautiful parklands, and the stunningly rugged Pacific coast. We also get the best views of the Golden Gate Bridge (assuming Karl the Fog isn’t covering it). We don’t worry about hills because our ebikes help us do the climbing. This tour has opened up so many new places for us to visit. We couldn’t be more excited to show you around electric-style. Electric bikes with plenty of battery. We use Specialized Comos, featuring three levels of pedal assist and 7 gears. Regular and “step-through” models available. Our e-bikes were selected for their power and long-lasting batteries. We ride at a casual pace and cover a lot of ground. An e-bike makes the pedaling much, much easier, however, you are riding a powerful bike and must put effort into it. You will need confidence and dexterity as we climb and descend very steep hills this tour. 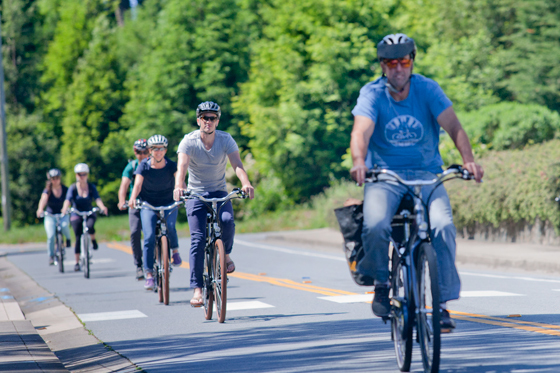 If you haven’t been on a bike in years, you should practice beforehand.